One of the concepts that I think is the most difficult for me and my ego to accept is the idea that just because I have done something well once does not mean that I will do it well every time I attempt it. At a point, we like to thing we have a particular task mastered, right? Sure, I can reliably get into halasana (plough pose) 99% of the time, but there are some days where my back just says, “NO.” I’m getting better at listening to the mental cues, but they are always humbling. In a way, they are the messengers I dislike the most, and probably the ones I need the most at the same time. It’s been that way with baking a lot lately. For a long time, baking was just that thing for me that I was reliably “good at.” But with going gluten-free, I’ve spent a lot of time lately feeling like a complete amateur. Every batter and dough is foreign, and every attempt is hopeful scientific experimentation mixed with prayers to the divine forces. This has been frustrating because for the first time in years, I haven’t been able to just wander into the kitchen and start throwing things together. I’ve had to measure and think about it all. I felt so much resistance to it, because it felt like my sanctuary had been stolen. My ego kept throwing internal temper tantrums, wanting to stray from every recipe and make it my own. But just like learning to cook and bake the first time around, I kept reminding myself that you have to create the solid foundation before you can start playing with the details. And though my ego still pouted in the corner, I began to feel the joy and excitement of the unknown return to my kitchen endeavors. 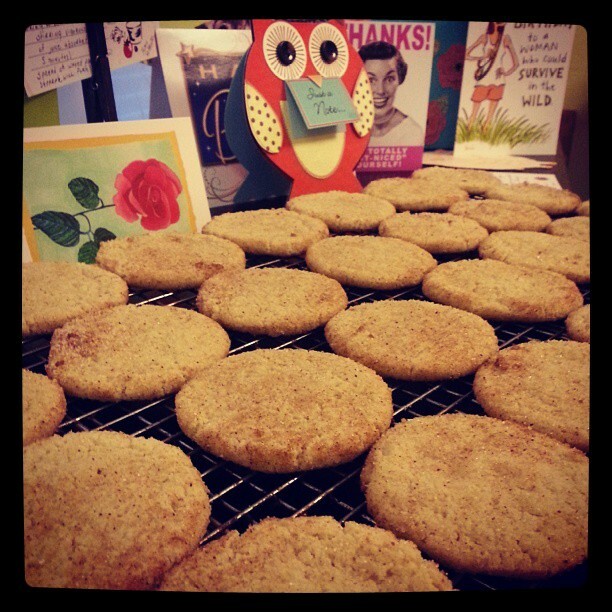 In letting go of needing to maintain the identity of “a good baker,” I afforded myself the opportunity to really learn from the gluten-free cooking resources I’d gathered. I discovered that (at least so far), I don’t care much for sorghum flour in cookies, millet flour adds the perfect crunch to pizza dough, brown rice pasta dough needs more xanthan gum and some tapioca to give it the right tackiness for rolling, bean flour gives things an odd smell, and that at the end of the day…it’s still all about ratios (Thanks, Michael Ruhlman!). Yeah, they’re that good. For those of you reading from the Folger or who donated to me for Warrior Dash, these might sound familiar. The version I made then was full of pecans, coconut, and M&M candies. This version nixes the M&Ms, but only because I didn’t have any on hand and (gasp) wasn’t in the mood for chocolate. I have no doubt they’d be a welcome addition. 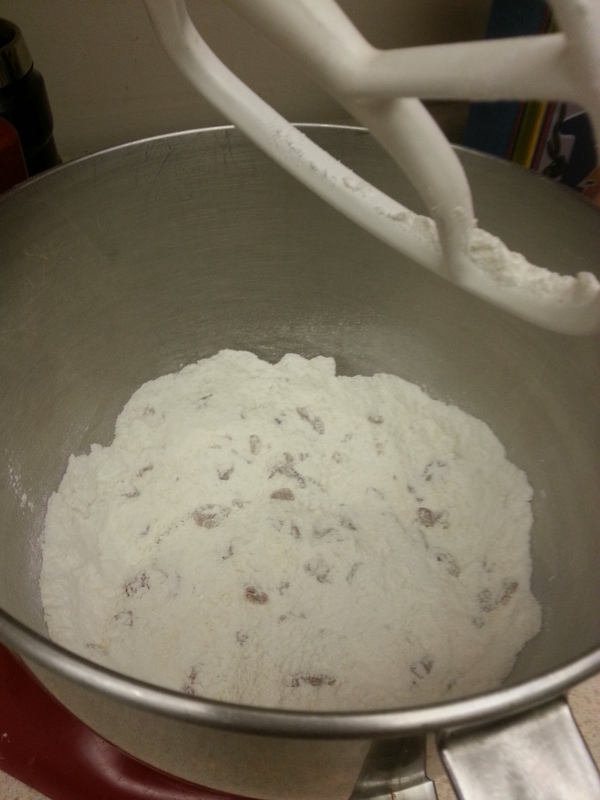 Combine the flour, cream of tartar, baking soda, salt, xanthan gum, sugar, pecans, and coconut in the bowl of a stand mixer and set aside. Brown the butter by placing it in a saucepan over medium heat. 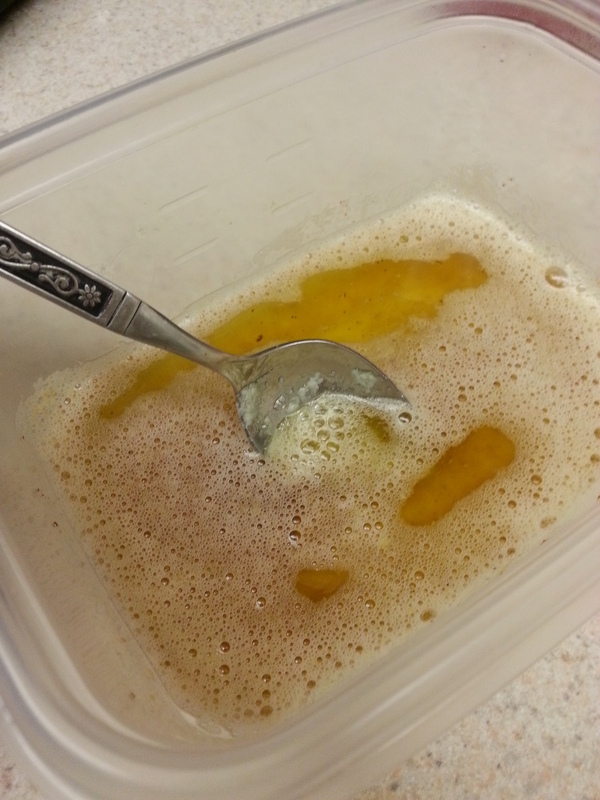 Stirring frequently, cook the butter until it is amber in color. Then move it to a small bowl and put in the freezer or refrigerator until it is still liquefied, but no longer hot to the touch. 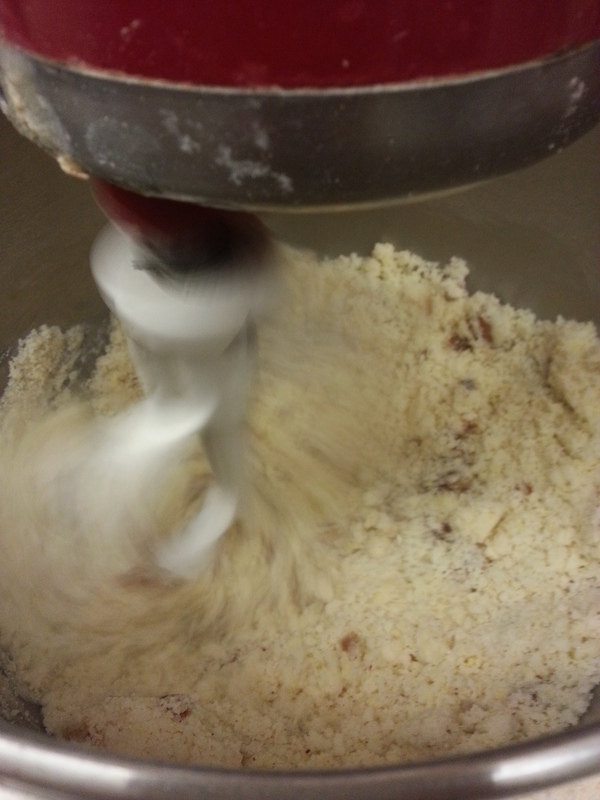 With the mixer running, slowly add the egg, butter, and vanilla extract to the dry ingredients and mix until the batter is clumpy. If it feels dry, you can add a few drops of milk, water or egg white to get the dough to come together. 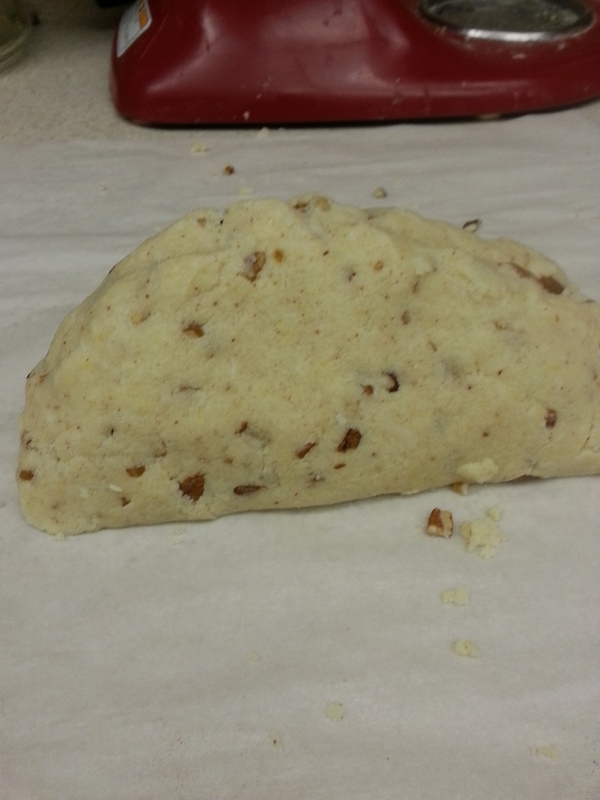 Scoop the dough out onto a piece of parchment paper and form into a log. 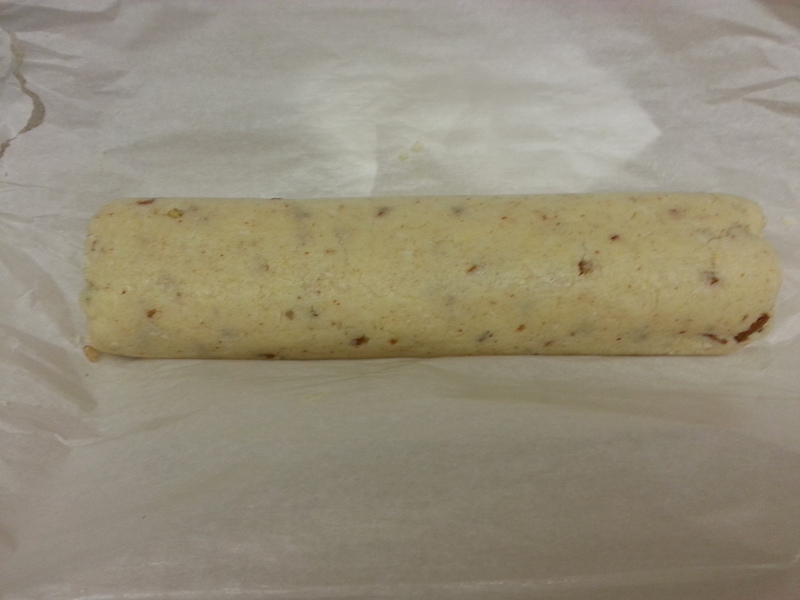 Wrap in parchment paper and freeze or refrigerate until firm. I usually freeze the dough for 30 minutes to an hour. If you aren’t feeling particularly patient, you can make these as drop cookies, but the dough freezes exceptionally well. I like to make a bunch of dough logs, freeze them, and have them ready for holiday cookie baking and gift-giving. Slice the chilled dough into ½ in. thick discs and place them on a parchment-lined baking sheet with 1-2 in. of space in between them (they will spread slightly). Bake for 8-10 minutes or until the edges are just beginning to brown. Cool on a wire rack, eat, and share with friends for maximum enjoyment. I thought that this dough would also make for excellent snickerdoodles, and since I was so determined to play, I approached it as I try to approach difficult arm or single-leg balances: If you fall and it’s ugly, at least you learned where the edge is! Fortunately, there was no such disaster and my intuition was right on in this case. To make these into sweet cinnamon-sugar delights, omit the pecans and coconut. In a small bowl, combine 3 tbsp. of sugar with 1 tsp. cinnamon. After freezing and slicing the dough log, toss the discs in the cinnamon sugar mixture and then bake on parchment-lined sheets. Voila! 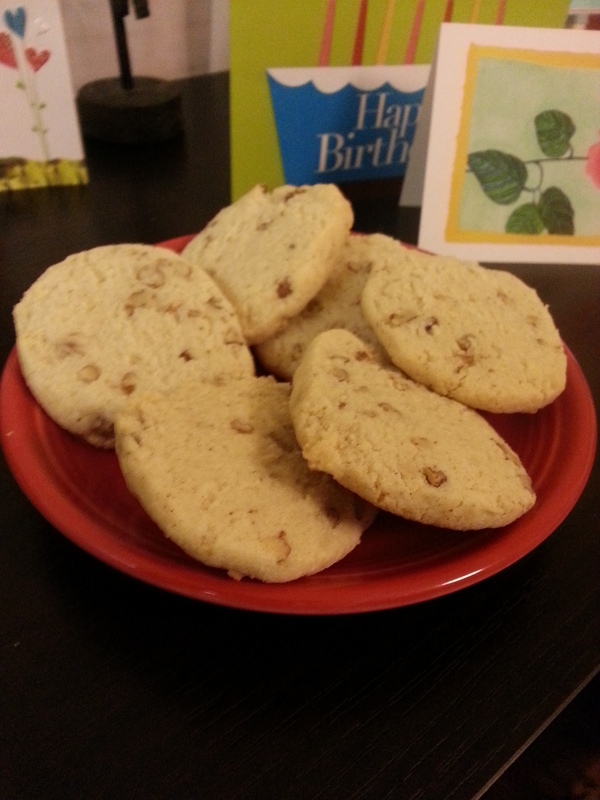 Now you have two distinctly different cookies from one simple method. Oh, the possibilities!